Don Raphael is an OSJ local. Born and Raise. 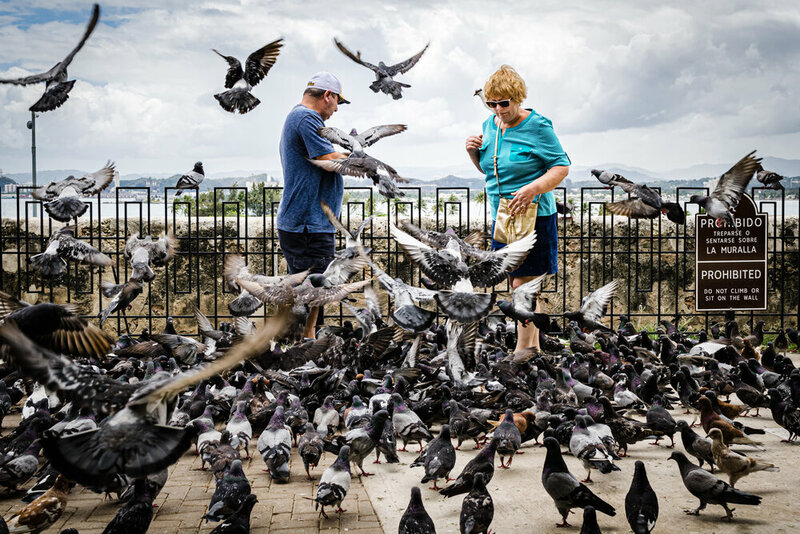 Every day Don Raphael feeds all the pigeons at Plaza Colón. This man decided to play his guitar and sing while waiting for his customers. What a better way to attract some customers to the store! The Vejigante is a folkloric character in Puerto Rican festival celebrations. While la Plena is a genre of music, chant and dance native to Puerto Rico. While cruising the streets, I saw this man playing his guiro and singing with happiness. As soon as he saw me he smiled and waved at me. Normal day on the streets. Almost everyday they all meet up at Plaza de Hostos to play Domino. "Express your Puerto Rican spirit here". At the end of Cristo Street in the heart of old San Juan, you will find the Christ's Chapel (Capilla del Cristo). It was built in the year 1730. Many tourist find them self attracted to this old but beautiful structure with many years of history and legends. 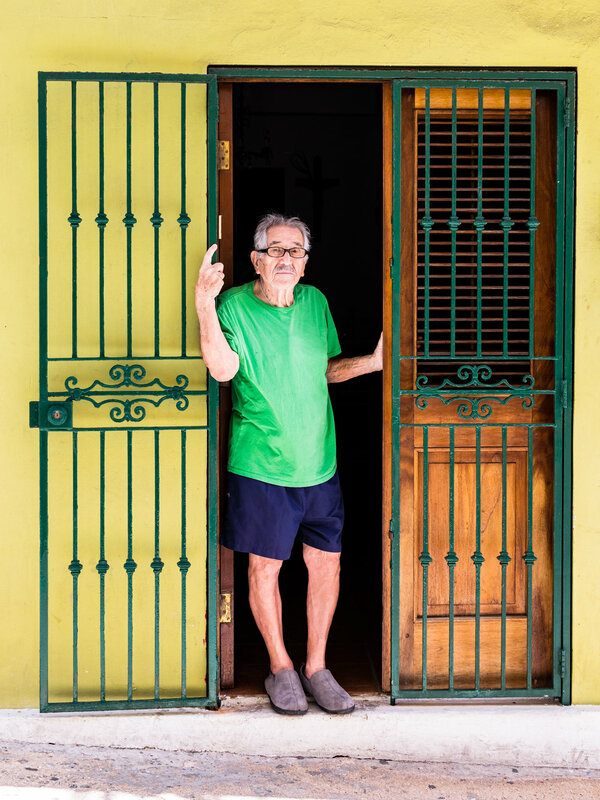 Angel Antonio is a street musician at Calle Cristo and a retired Cataño Ferry captain. OSJ city locals at calle de La Fortaleza. Parque de las Palomas is a small park located at the end of Cristo Street and next to Capilla del Cristo. 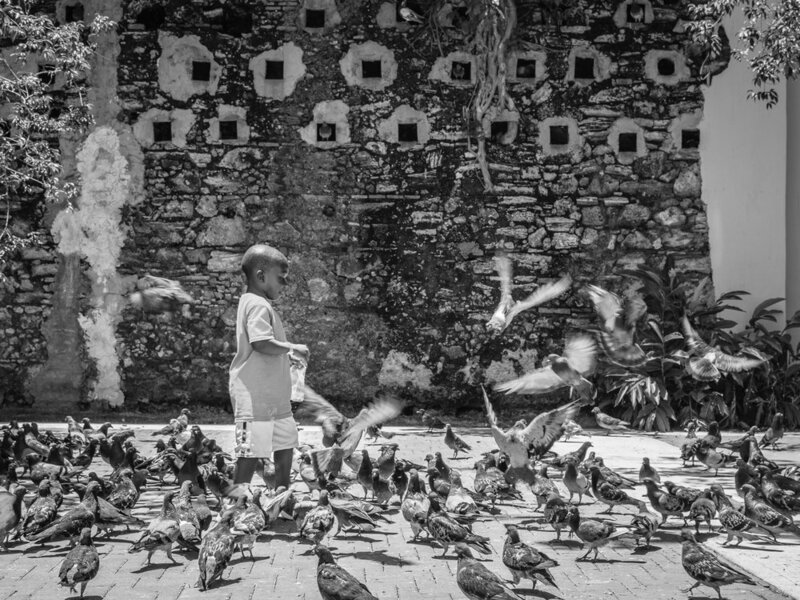 Here the pigeons of the area find shelter and food, as you can purchase bird seeds and feed the birds yourself. 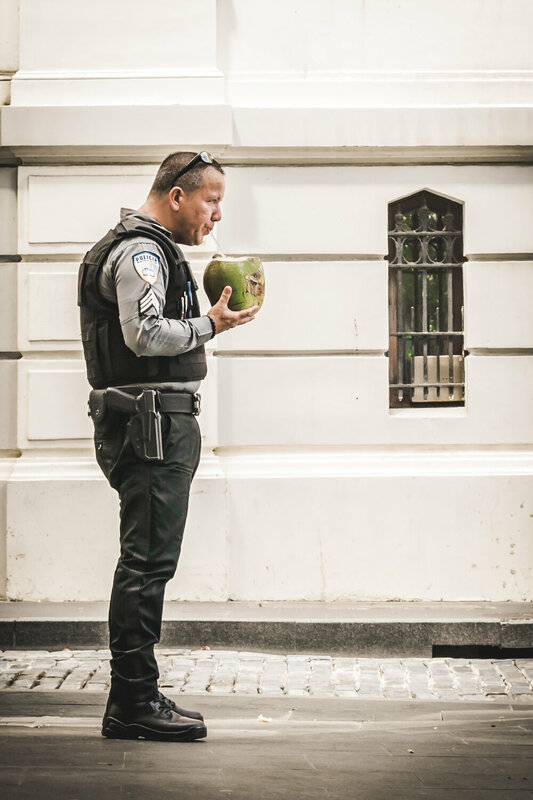 Nothing better than fresh coconut water on a very humid day. Street musician that plays and sings songs alluring to Puerto Rico's beauty and culture. 97 year’s old and resident at la Calle Tanca. 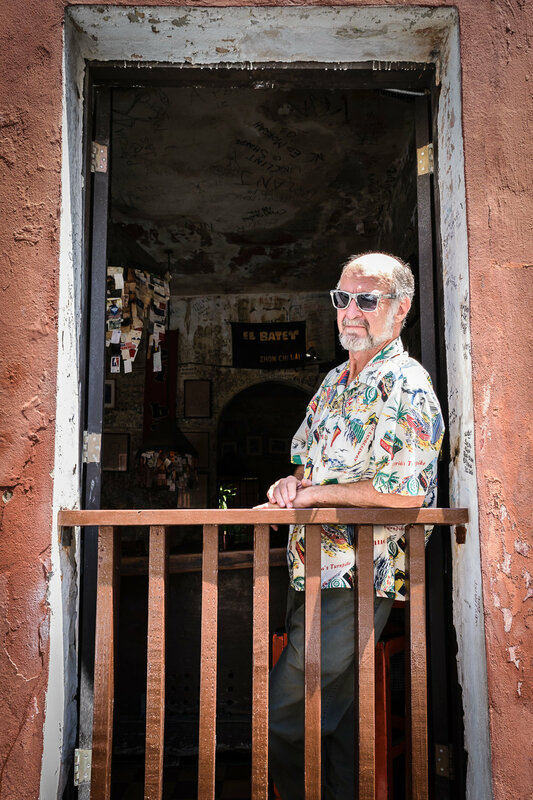 Around 200,000 tourist visit Old San Juan monthly. At the end of Tetuan street you will find this small but relaxing plaza overlooking the San Juan bay. Paseo de la Princesa in a rainy day. Gámbaro Alley. 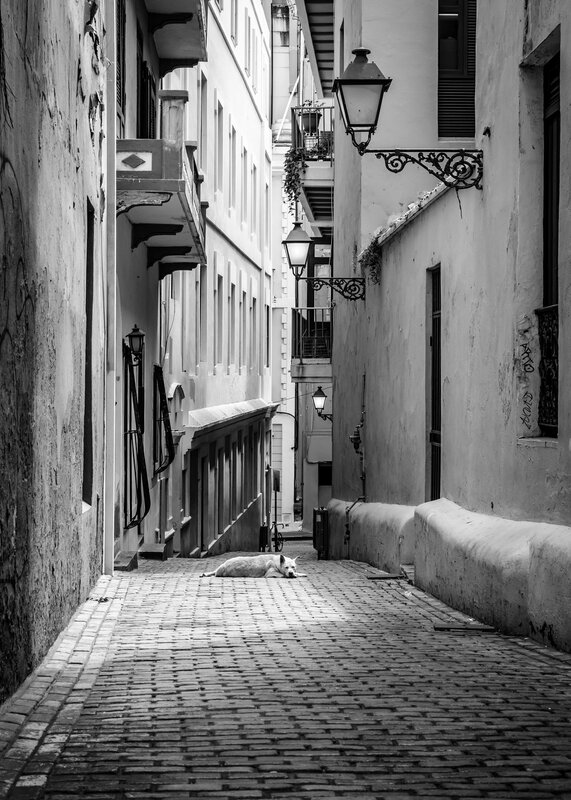 This dog travels all the streets of the town but he always returns to his owner that lives in an apartment in this alley. It is just amazing listening to him play. Very gifted musician. Re enact historic moments in Old San Juan. Make time for quiet moments, as God whispers and the world is loud. Cuartel de Ballaja. Museo de las Americas.